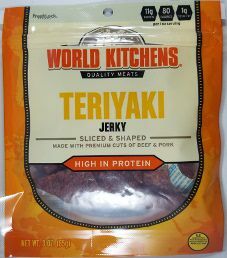 The next review on World Kitchens will focus on a 3 ounce/85 gram bag of their teriyaki sliced and formed beef and pork jerky. This flavor is described as using the perfect combination of ingredients to create a teriyaki explosion, wrapped up by a bold smoke flavor. This bag was purchased at a convenience store in Lewiston, New York. 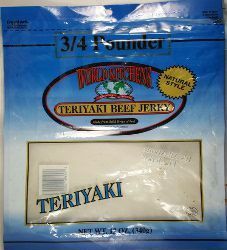 Note: For a current live taste review on a tweaked ingredient list and bag design, open up World Kitchens – Teriyaki Beef Jerky (Recipe #2). The next review on World Kitchens will be on a 3/4 pound/12 ounce/360 gram bag of their teriyaki flavored beef jerky. This bag was purchased at a convenience store in St. Augustine, Florida back in 2011. 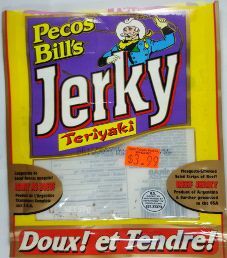 Note: For a current live taste review on a tweaked ingredient list and bag design, open up Pecos Bill’s – Teriyaki Beef Jerky (Recipe #2). 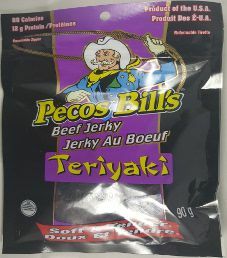 The next review for Pecos Bill’s will be on a 2 ounce/57 gram bag of their teriyaki flavored beef jerky. This jerky bag was purchased at a convenience store in Brampton, Ontario, Canada, back in 2008. The next review for Pecos Bill’s will focus on a 3.17 ounce/90 gram bag of their teriyaki flavored beef jerky. This will be the second review on Pecos Bill’s teriyaki flavor, where the ingredient list and bag design have changed since 2008. The jerky bag was purchased at a Walmart store in Brampton, Ontario, Canada. 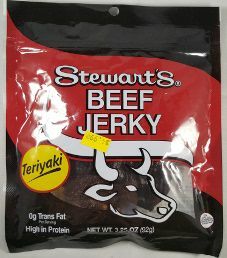 The first review for Stewart’s will focus on a 3.25 ounce/92 gram bag of their teriyaki beef jerky. This flavor is advertised to use premium cuts of beef, seasoned and smoked to perfection. The bag was purchased at a convenience store in East Rutherford, New Jersey.